If you're looking for a unique engagement ring and want something a little more colorful than your standard diamond, an aquamarine ring is a great choice. This striking pale blue gem is the official birthstone for March, and it's also an affordable and beautiful centerpiece for an engagement ring. Whether you choose a solitaire or a diamond-accented design, you'll love the way this gemstone sparkles on your finger. One of the simplest choices for an engagement ring, this style features a single aquamarine in a classic setting of white gold, yellow gold, or platinum. Oval-Cut Aquamarine Solitaire - A stunningly simple design showcases oval cut aquamarine in this classic solitaire. The plain band and prongs are 18k white gold. This pretty ring comes in sizes four through ten and retails for just under $400 on Amazon. 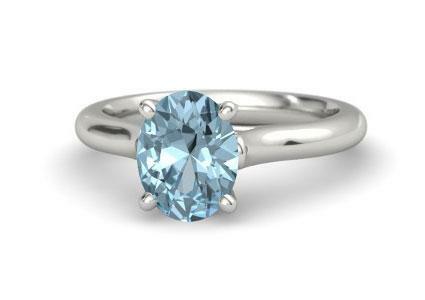 Ivy Ring - This offering from Gemvara consists of a nine-millimeter oval aquamarine set in a simple 14k white gold band. Perfect for the bride-to-be who loves classic style with a twist, this beautiful ring retails for about $1,450. It's available in sizes four through ten. Art Deco Crown Aquamarine Ring - This antique-style beauty from Antique Jewelry Mall is a stunning choice. An elaborately carved platinum band supports a crown-style setting for a one-carat round-cut aquamarine. This exquisite ring is available in sizes four through nine and retails for just over $2,200. A three-stone ring is another classic choice. This style typically features a center stone flanked by two smaller gems. Some styles feature only aquamarines while others pair the stone with diamonds or other gemstones. Caroline Ring - The Caroline ring from Gemvara is eye-catching and beautiful. It features a 0.6-carat princess cut aquamarine flanked by two princess-cut white sapphire side stones set at an angle and totalling 0.36 carats. 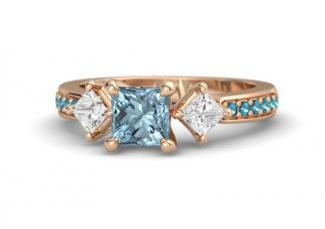 The 14k rose gold band is set with 0.11 carats of London Blue topaz to provide additional color and sparkle. It comes in sizes four through ten and retails for about $1,100. Estelle Ring - This unique three-stone ring from Gemvara is set in 14k yellow gold. A cushion-cut six-millimeter aquamarine sparkles between two four-millimeter round London blue topaz gems. The overall effect is lovely. This ring comes in sizes four through ten and retails for about $700. Aquamarine Three-Stone Ring with Palladium - This beautiful option from Gemvara features three cushion-cut aquamarine gems set in a 10k yellow gold band. The ring is somewhat customizable; you can choose the size of your center and accent gems. If you choose, you can customize this design by choosing other gems for the flanking stones. The ring is available in sizes five through nine and retails for just over $900. Diamonds can set off the icy blue of aquamarine, drawing attention and adding sparkle to the center gem. There are many designs, some of which will work with a band-style wedding ring. You'll find diamond-accented options ranging from simple to very ornate. Aquamarine and Diamond Split Shank Ring - This stunning option from Blue Nile boasts an eight-millimeter by six-millimeter oval aquamarine. The 14k white gold ring has a split shank design with 32 pave-set diamonds, totalling 0.15 carats. This beauty comes in sizes 4.5 through 7.5 and retails for just under $1,000. Aquamarine and Diamond Princess-Cut Ring - This beautiful ring from Antique Jewelry Mall is inspired by the Art Deco period. It features a 1.21-carat, princess-cut aquamarine surrounded by dozens of round-cut diamonds, totalling 0.34 carats. The 14k white gold band boasts beautiful engraving and milligrain details. This ring is available in sizes four through 9.5 and retails for just under $3,000. Olivia Ring - Featuring a two-carat, cushion cut aquamarine surrounded by a halo of diamonds and set in a diamond-studded palladium band, this ring from Gemvara is a head-turner. The 0.4 carats of accent diamonds give this design incredible sparkle. This ring, which comes in sizes four through ten, retails for about $2,700. Many aquamarine rings have a subtly vintage style for a reason: this gem was very popular during the Victorian and Art Deco periods. 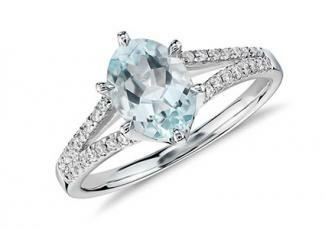 If you love these antique styles, you might want to consider purchasing an antique aquamarine engagement ring. You can find these lovely rings in some local antique shops as well as online. 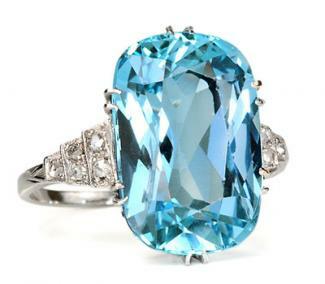 Lang Antique & Estate Jewelry - Specializing in jewelry of years gone by, Lang has a great selection of antique aquamarine rings. You'll find rings from the 1880s through the 1930s, most ranging in price from about $1,200 to $10,000. The Three Graces - This antique jewelry store also has a lovely selection of aquamarine rings. With prices ranging from about $600 to $6,000, you'll find rings from every era and in many unique styles. Fay Cullen - With a huge range of antique and vintage rings, this is a good place to shop for an aquamarine ring from a bygone era. Prices range from $500 to $5,000 on these estate and consignment pieces. As with any major purchase, it's good to know as much as possible before you being shopping for an aquamarine ring. Understanding the basics about this stone and the various settings will help ensure you get a good deal. 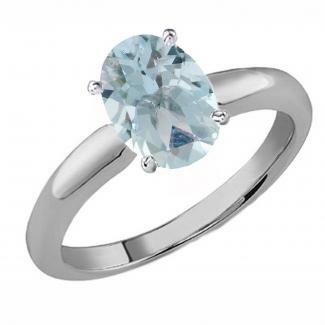 Unlike other diamond alternatives, aquamarine is actually a relatively hard stone. Rating an eight on the Mohs Scale of Hardness, this gem isn't prone to scratches, cracks, or other damage. This means you can choose a setting that focuses on showing off the stone by allowing as much light as possible to reach it. There isn't a standard color for aquamarine. In fact, any gem in the beryl family that is blue to greenish-blue is called an aquamarine. This is something to keep in mind when shopping online since monitors can display colors differently. If you're unsure about the color and have a specific shade in mind, check the store's return policy before you order. Lab-created aquamarine gems are fairly common, especially at lower price points. If buying a natural aquamarine engagement ring is important to you, make sure the description clearly states that the stone is natural and not lab-created. You can also ask for a certificate of authenticity. Whether you choose a modern solitaire design or an antique or vintage-inspired ring, you'll find that aquamarine makes a stunning centerpiece to any engagement ring. These gorgeous pale blue gemstones offer a unique diamond alternative for brides-to-be who want something a little different for this important piece of jewelry.